It occurs to me that this could be a teaching moment about melanoma. My first melanoma began as a large freckle on my left ankle, the size of a dime, with a small flat black mole on the bottom edge of it. The pair had been there since I was a teenaged sun worshipper in the Hawaiian Islands, slathering on baby oil to gently sauté my skin to a golden brown in the tropical sun. Fast forward thirty-some years to a Jazzercise class in Eugene, Oregon. At the first spring class, I put away my leggings and wore shorts. At the end of class, we were stretching, and I had my face down by my ankle for a close view. 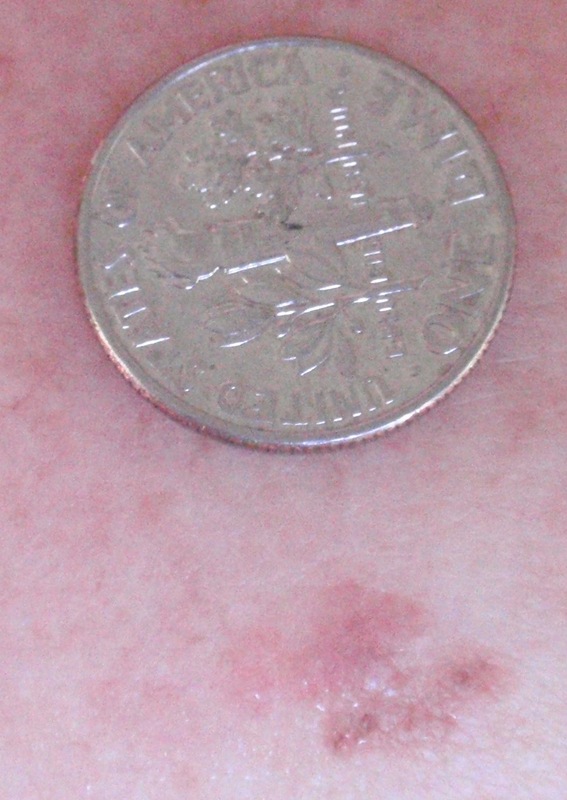 The freckle was puffed and pink, now the size of a quarter, the flat black mole was raised up tall, and at the top of the freckle was a little pink nodule with a vein clearly visible in it. The next morning, the freckle was as brown and flat as ever, but the mole was still tall, and the little nodule still there. When I scratched lightly on the freckle, it puffed up pink. Since I’m a writer, research is my middle name, and my skin full of moles (I’ve had over a dozen small squamous cell carcinomas cut or frozen off my chest, face and forearms over the years), I went to the internet to look at photos of melanoma. (If you want to see some real nightmare stuff, Google melanoma photos. Good lord!) Mine didn’t look anything like that. But, I reasoned, could it eventually. I went to my family doctor who said he was certain it was nothing, but biopsied not only the tall black mole, but the little nodule. In doing so, he cut right through the freckle. 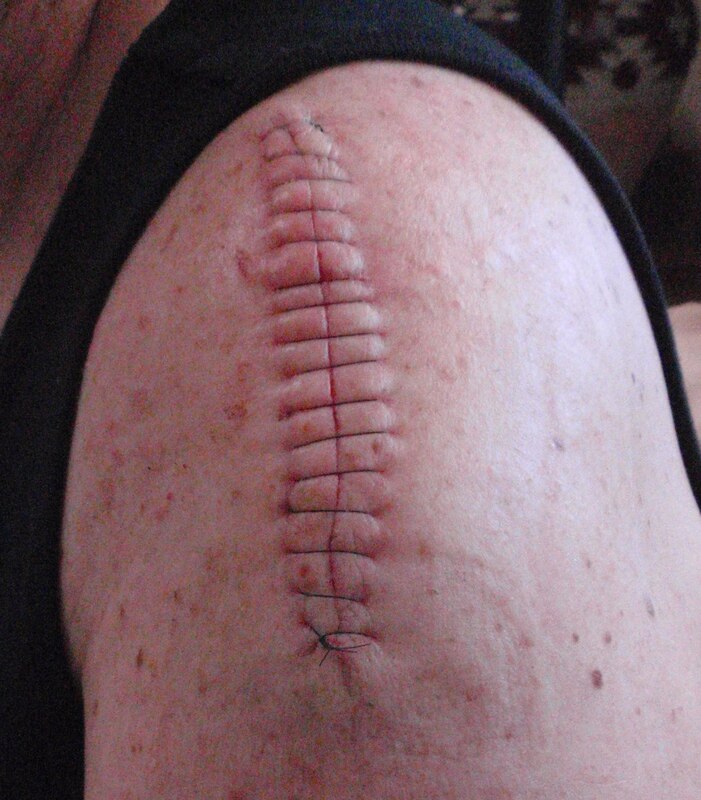 The mole came back malignant melanoma, Breslow’s .9mm, Clark’s level IV. The nodule came back melanoma insitu. No clear margins. I had a Wide Local Excision with a 3” in diameter skin graft and a sentinel node biopsy. This is where they inject blue dye into the tumor to see what lymph basins it will drain to. Mildly interesting. Made me pee blue for two days. The freckle was all melanoma. They took out two lymph nodes, both negative for tumor. “What’s next?” I ask. “If you start coughing blood or have a seizure, give us a call,” was the response from the surgeon. Well, thanks to the internet, the Melanoma Patients’ Information Page (www.melanoma.org), and a lot more research, I am far more knowledgeable about melanoma than either my general physician or that surgeon. I have taken it upon myself to stay abreast of treatments and my own body. Eighteen months after my WLE, I found an oncologist and argued my way into a brain MRI and a body CT scan, all with negative results. He told me that from here on out, call if I had any symptoms (like what? A seizure or coughing blood? ), but it wouldn’t matter if it happened in June or in November, by that time I would be Stage IV and quality of life, blah blah blah. Meantime, he reiterated that they caught my tumor early, and my chances were good. Fast forward again, 9 years later. The cloud of a recurrence or a metastasis has slowly dissolved over the years. I was in the clear. But wait. What’s that weird mole on my shoulder? Has it always looked like that? I’ve learned over the years that if I run to the dermatologist every time something weird pops up on my skin, I’d be going once a week. (One dermatologist told me that I had ruined my skin in Hawaii and skin cancers would be popping up on me like mushrooms some day.) So I took a photo of this mole and wrote on my calendar to check it again in forty days. I read somewhere once that nodular melanoma doubled in size every forty days. After forty days, I took another picture and compared them. And another. By now, I could see a significant difference. I had it biopsied, as melanoma is a cancer that becomes lethal in increments of tenths of a millimeter. Sure enough. Melanoma. Dammit. .8 mm. The storm clouds that had just dissipated came roaring back. After the first melanoma, my chances of getting a second one were 8% higher than the normal population. After the second, my chances of getting a third zoom to 33% higher. Now I’m hyper vigilant. And I need you to be, too. First: if you have moles, know them. Be familiar with them. Notice any changes in them, and if you find one that’s crusty or bleeding, get thee to a dermatologist. Secondly: Know the A, B, C, D, E signs of melanoma. A – Asymmetrical. Most moles are symmetrical. 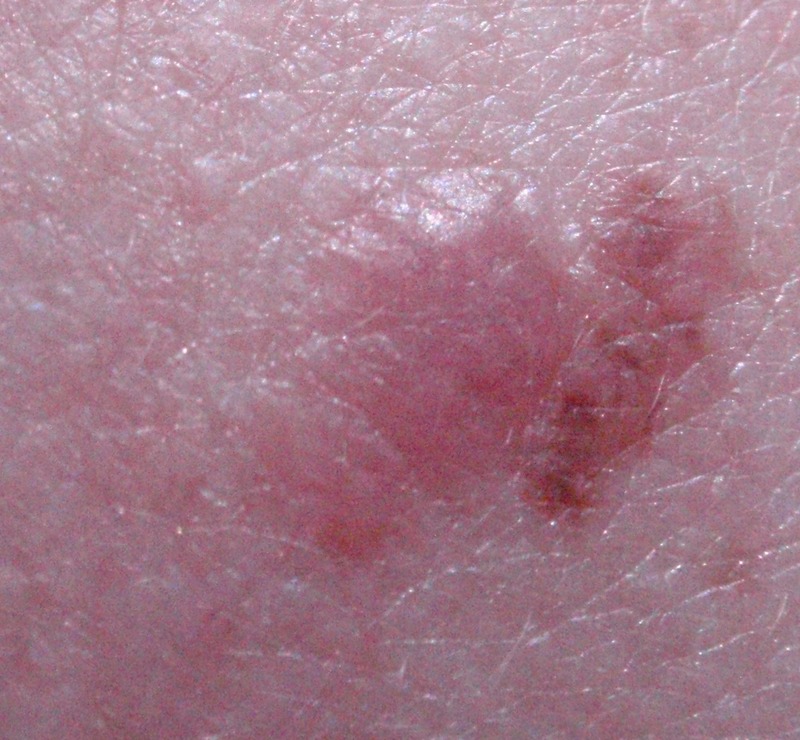 Melanoma pushes a mole out of its normal boundaries. B – Borders. Cancer is not organized, so it grows haphazardly as the immune system is trying to suppress it, resulting in notched borders. C – Color. Melanoma can be many colors, including amelanotic, meaning no color at all (skin color). Blue, red, pink, brown, black, pale… check into it. D – Diameter. If you have a mole bigger in diameter than a pencil eraser, it has potential. Be aware. E – Evolving. Anything suspicious that changes. Melanoma kills. Don’t be afraid, be aware. Get skin checks. Wear sunscreen. Wear a hat. That’s the phrase: Fighting Cancer. We call ourselves “warriors.” But is it really the cancer we fight? Sure, there’s an element of that, and I can’t speak to the whole range of waging war from first diagnosis to final dying breath. I’ve been lucky. But I’ve had cancer twice now, and I can speak to the war that I wage. I don’t want to live my life in fear. I want to live in love and light and joy. I don’t want melanoma to rob me of that. It may, sometime in the future, but not now. Now I am only Stage 1, for the second time, and still the fears begin to collect in the wee hours of the morning. And believe me, there is enough to fear. With each thing I read, with each conversation I have with those who have only the finest of intentions, with every glance at the tumor on my shoulder, and soon the scar where the tumor used to be, the fear nibbles at my consciousness. People who love me say all the right things, but even “Good that you caught it so early,” sparks fears that I didn’t catch it early enough. “You’ll be fine,” translates to a slow, steady march toward an ugly black death. It’s nothing to make a doctor’s appointment, to get an injection, an excision, an infusion. It’s nothing to get a scan and wait for the results. That is medicine battling cancer. My war is much different. A wise person said to me not long ago: “The only struggles you will ever have are with yourself.” I have found that to be true then, and true every day since then. And so it is with fighting cancer. This is a struggle between me and me. Between my heart and my soul. What cancer does to my body I can do little about except hope to make the all the proper decisions at the appropriate moments. Meanwhile, I wait for my surgery appointment and work hard not to torture myself or others. I try to educate people about sunscreen and sun protection and checking their moles regularly for changes. I want people to be screened regularly by their dermatologists. The problem is, the best way to get the attention of others is by revving up their fears. I show them the scar on my ankle (a 3” diameter skin graft), and catch myself saying, “Aren’t you glad that’s not on your face?” And I’m ashamed of myself for working so hard to keep the fear from my own mind while pouring it onto others. Be kind to those who are fighting cancer, for their enemies are legion. For me, for today, I’ll let the doctors fight my cancer, and I’ll concentrate on fighting my fears.